Made for iPhone (9) ? Starkey Hearing Technologies is the largest manufacturer of hearing aids in the United States, and indeed, the only major hearing aid manufacturer headquartered in this country. Starkey first opened its doors in Minnesota in the 1960s to make hearing aid earpieces. The company also owned and operated retail hearing aid outlets, and continues to distribute hearing aids today through its own retail chain as well as through independent retailers. Starkey's American heritage remained a central part of its identity, even as the company grew to become a global business, employing more than 500 people and operating in 100 markets worldwide. United States Presidents Ronald Reagan and Bill Clinton wore Starkey hearing aids. So did Mother Teresa, perhaps because another pillar of the Starkey’s history has been a commitment to philanthropic endeavors supporting people living with hearing loss. Since its inception in 1984, the Starkey Hearing Foundation has donated more than 1 million hearing aids to those in need around the world. Starkey hearing aids boast a range of advanced signal processing technologies, developed and tested in the company's own research center in Berkeley, California and in other US and international facilities. Starkey introduced the world's first completely invisible-in-canal hearing aid, and was among the first to release a made-for-iPhone hearing aid. The current iterations, invisible-style SoundLens iQ and made-for iPhone Halo iQ hearing aids are now in their third generation. 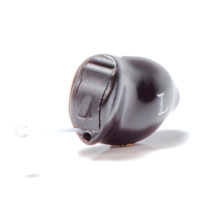 Like most hearing aid brands, Starkey uses a numbering system to indicate the performance level of its hearing aids. The higher the number, the higher the performance level. The number also represents how many channels or bands of the hearing aid includes. For example, the i1600 performance level includes 16 channels, while the i2000 and i2400 performance levels include 20 and 24 channels, respectively. The number of channels or bands indicates, to some extent, how well the hearing aid can separate and process distinct sounds without causing unwanted side effects. For instance, a multi-channel hearing aid can reduce background noise in certain channels without altering speech sounds present in other channels. While the number of channels a hearing aid has is important, this probably matters less than the types and quality of digital signal processing the hearing aid offers. Starkey's latest hearing aids are based on the new Acuity OS 2 operating system, which supports noise cancellation, voice and music enhancement, ear-to-ear wireless communication, and made-for-iPhone connectivity for streaming music and phone calls directly from Apple mobile devices. A simple, but welcome new feature you will find find across the Halo iQ, SoundLens iQ and Muse iQ product lines is that the hearing aids announce the name of the listening program using spoken words. It's easy to forget how to use each program when all the hearing aids tell you is "beep" or "beep-beep" as you change from one program to the next. With hearing aids in Starkey’s iQ range, you would hearing the word “restaurant” if you changed to a program intended for use in restaurants. It’s a nice touch that makes these hearing aids a little easier to use than some others. In the sections below, you'll find information on Starkey's current and most popular hearing aids models, along with pricing and feature information so you can determine which Starkey hearing aid is appropriate for you. If you're simply looking to get your Starkey hearing aids repaired, or looking for Starkey parts, like wax filters or domes, feel free to give us a call and we'll point you in the right direction. Otherwise, feel free to review the popular models below, and at the top of this page you'll find links to each Starkey hearing aid model, along with prices, features, and online ratings, and more in-depth Starkey reviews on each product page. Halo iQ is a made-for-iPhone hearing aid that allows direct streaming from Apple mobile devices. 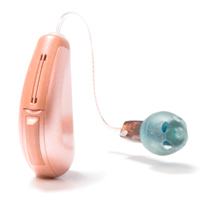 Available only as an RIC-style hearing aid, it comes with size-312 or size-13 batteries. These hearing aids stream audio and phone calls directly from Apple mobile devices, just like a set of wireless headphones. It's the ultimate convenience for talking on the phone or enjoying media on your iPhone or iPad. If you use Android devices, you'll need one of the SurfLink wireless accessories to stream audio from your device, but you can control the hearing aid settings directly from Starkey's TruLink app (without additional accessories) using Apple or Android devices. The app allows you to personalize how the hearing aids sound, fine tune the noise cancellation, and geotag your settings so the hearing aids can automatically revert to your favorite settings when you return to the associated physical location. Halo iQ hearing aids now offer improved directional hearing performance compared to the previous Halo hearing aids. The new Acuity OS 2 operating system in Halo iQ is designed to restore a more natural sense of space and direction, while at the same time reducing background noise even more than before. What makes the improvement possible is the use of a wireless link between the right and left hearing aids that allows the them to work together rather than independently. The new operating system also adds the ability for the hearing aids to process speech and music separately. Processing designed for speech can lack the loud and soft dynamics, and full frequency range needed to represent the nuances of music. Halo iQ hearing aids detect not only speech and music, but also noise, wind, and quiet listening situations. The hearing aids automatically adapt to give you the best hearing aid settings for every listening situation. You want fully-featured hearing aids with made-for-iPhone audio streaming. The idea of adaptive sound processing specifically dedicated to enhancing the quality music appeals to you. You already own one or more Starkey SurfLink wireless accessories, and want to keep using them but upgrade your hearing aids to add made-for-iPhone wireless connectivity. Muse iQ hearing aids run on the Acuity OS 2 operating system, like their Halo iQ sibling, which means Muse iQ include the same digital signal processing, automatic program changes, and directional hearing features as Halo iQ. The RIC-style Muse iQ with size-312 batteries even looks identical to its Halo iQ counterpart. The most important difference is that Muse iQ comes in a wider range of styles and includes the Synergy® wireless platform instead of made-for iPhone Bluetooth wireless. The Synergy platform uses Starkey's 900sync technology - a 900 MHz wireless radio - to allow wireless communication with Starkey SurfLink accessories. The Synergy platform and 900sync technology also support wireless CROS functionality, for streaming audio from one hearing aid to another. This lets people with no usable hearing in one ear to hear comfortably from any direction, without craning their neck to favor their better-hearing ear. Individuals requiring a little more power than the RIC style can choose from two BTE styles. Muse iQ also come as custom in-ear or in-canal styles. Before getting a custom hearing aid, you would need to visit a hearing care professional to have ear impressions taken. The hearing aids would then be made to fit your ears. Smaller, custom hearing aids are more prone to feedback than RIC hearing aids, but Starkey's feedback cancellation, included in every Muse iQ hearing aid, does a good job preventing whistling. Frequency lowering, for shifter high-pitched tones to a lower range, and tinnitus-masking sounds are also included at every performance level. Muse iQ are available at the i1600, i2000, and i2400 performance levels. Your main priority is a compact hearing aid with effective feedback (whistling) cancellation. The idea of adaptive sound processing specifically dedicated to enhancing the quality of music appeals to you, and you don't need made-for-iPhone wireless connectivity. Muse iQ rechargeable are the smallest rechargeable hearing aids available - and they come with an all-in-one charger for at-home use or portable recharging without an electrical outlet. Muse iQ Rechargeble are similar to the RIC-style Muse iQ, but with a custom, fast-charging Lithium-ion battery completely encased in the hearing aids. High capacity batteries, absence of an external battery door, and a smooth exterior with no electrical charging contacts make these hearing aids smaller and better looking than others. Most brands that offer rechargeable hearing aids use ZPower, a third-party conversion kit that allows installation of rechargeable batteries in place of disposables. Starkey offers Zpower options too, but the custom charging system is faster, simpler, and easier to use. Another unique feature in Starkey’s charging system is that is has a built-in battery pack for recharging without a power outlet. It's a handy ‘extra’ that keeps you prepared when the power goes out in your neighborhood during the night. You want the smallest rechargeable hearing aids available. You think you would appreciate hearing aids that preserve the dynamics of music and enhance speech. You prefer to buy from an American hearing aid manufacturer. Starkey created the invisible-in-canal hearing aid style when it launched the first SoundLens hearing aid in the year 2011. Starkey still stands out from the competition when it comes to making hearing aids that don't stand out. 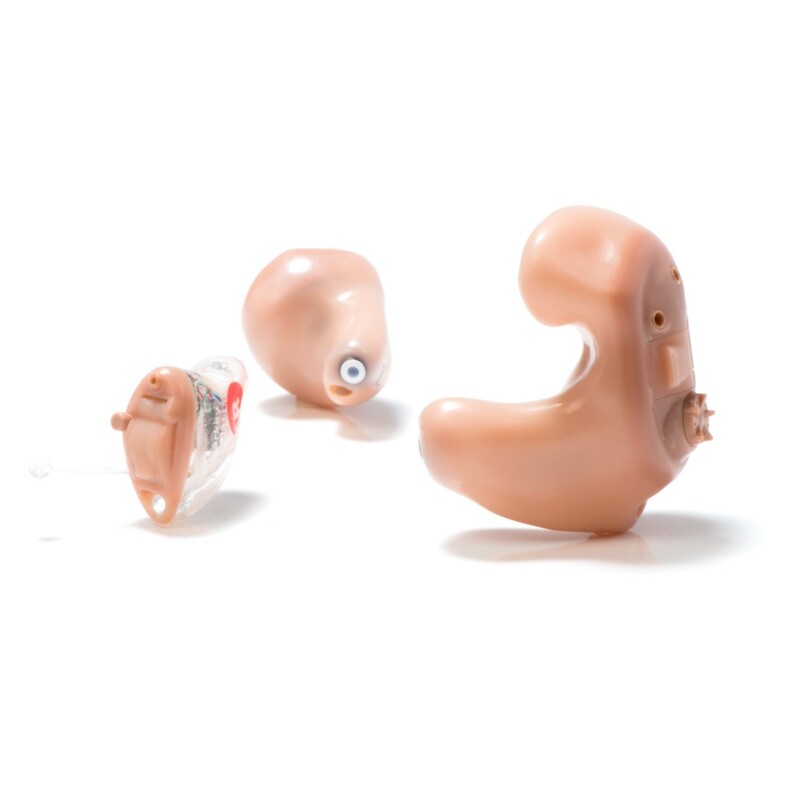 In our experience, Starkey has consistently built the smallest and most comfortable custom hearing aids in the world. The latest SoundLens iQ hearing aids share the Synergy platform and Acuity OS 2 operating system of its Muse iQ sibling. SoundLens iQ keeps as much of Muse iQ's technology than can reasonably fit in such a tiny hearing aid. For example, SoundLens iQ includes ear-to-ear phone streaming so you can hold the phone to one ear, but hear it in two. It has feedback cancellation to prevent whistling, and personalized therapeutic sounds for tinnitus relief technology. It is even compatible with SurfLink wireless accessories for remote control and audio streaming. 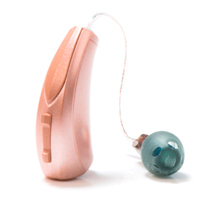 Starkey's Acuity Immersion technology, designed to restore a natural-sounding sense of direction, actually works better with invisible hearing aids than with other styles. That's because your own ears reflect sound toward the microphone of hearing aids hidden discreetly in your ear canal, just as they would reflect sound toward your eardrum in natural hearing. You want to look, feel, and act as if you're not wearing hearing aids, even if you have severe hearing loss. You would like to try Speech Shift frequency-lowering technology to help you hear high-pitched sounds, such as women's' and children's voices. Music is your passion. You love the idea of dedicated sound processing for music, extended high-frequency response, and the ability to use standard headphones together with your hearing aids. VERIFIED BUYER | Evansville, IN	? Sound quality is good and they are very comfortable to wear. I even forget I have them on. The only con I have experienced is in the ease of putting them on. I have MS and my fingers don't work as well as everyone else's so it takes more time and effort to put the hearing aids on. I was in a store yesterday, and for some reason my left hearing aid came out. Since my fingers don't work well, I had to put the hearing aid in my purse until I returned to my car where I could look in the mirror and put it back on. Great sound quality, great comfort, but less than thrilled that these do not come with all the features as advertised. It is my understanding that some of the features just aren't "released" yet, and are not available on my unit. Example, I wanted the beats per minute tracker on my aids, and 2 months after getting them, learned that it will not be available on mine, only rechargeable. So I feel like Starkey should be more clear in advertising the product, that not all AI features are totally ready right now and not are all available in all models. VERIFIED BUYER | High Ridge, MO	? The sound quality is great, better than expected. They are very comfortable, I hardly know I'm wearing them. They are very durable and reliable, a con might be the battery life is only 4 or 5 days, but the Pro's outweigh the Cons, I'm very happy with my hearing aids and love that I can control the volume through my i-phone and select the different listening options from my phone and I can also listen to music and answer calls that feed right into my hearing aid blue tooth. VERIFIED BUYER | Port St Lucie, FL	? Good sound ..very satisfied with the size and the size of the new Starkey aid. I like the different sound adjustments they offer over my old aids. They are t v ,restaurants and normal sounds. I also like the location that was assigned to service my aids. VERIFIED BUYER | Columbia, PA	? Very good sound but batteries are only lasting for 2 days disappointed with that. VERIFIED BUYER | Virginia Beach, VA	? I have had my hearing aids now for three weeks and after the second visit my hearing had improved beyond my expectations. The fitting of the ear piece is very comfortable, and hardly noticeable by everyone i’ve encountered. The rechargeable batteries with the charging station is a blessing. We have loaded a couple of programs to assist my listening enjoyment of the television. It has helped with the background music that was overwhelming the talking of the actors. So to say the least i’m really pleased. I am happy enough with my Picasso's, I got the invisible in canal model. While there are some things I don't like about them (one slips out, they feel annoying), overall they are the best invisible hearing aids that I have worn. Sound quality is excellent, my main concern is around the physical fit of the hearing aids, but I do not believe there is anything better, based on my research. I have worn Starkey Z Series i110 hearing aids for a few years, with decent success. Despite they very high price I was quoted I took these on a trial recently as they were on promotion as being brand new, and hence discounted just a bit. I am thrilled with the technology, they are a drastic improvement over the previous aids. The new accessories are much sleeker too, that is a nice change, I am loving using the remote microphone. I do wish these aids would connect directly to my iPhone though, but I am one happy gal with these Livios. VERIFIED BUYER | Ponte Vedra Beach, FL	?